the server disconnects every once in a while. When it happens, Affinity doesn't really seem to care (no warnings whatsoever), at least not until I try to save the file. 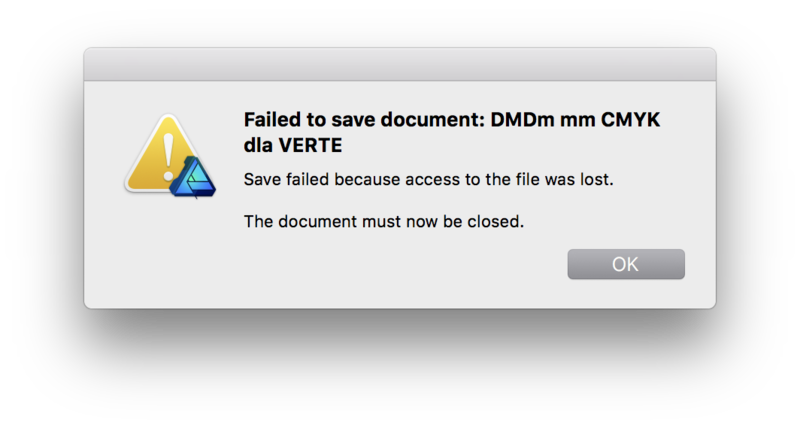 Only then I get the attached popup ("Save failed because acces to the file was lost.") and the document closes, even when the server/network drive has been reconnected. It allows me to recover the autosave when I reopen the file, however, since I'm used to hitting cmd+S right after I make some important changes, these are often lost. I think one of these solutions could help – either check if the drive was reconnected / remind to reconnect (that would be perfect), or make an additional autosave before closing the file, or at least give some warning when the connection is lost, not upon attempt to save. I think we could be doing better with regards to losing the work even when the drive has been reconnected, and have made a bug report for this. I'll pass your improvement suggestions along for consideration. Recently it happened to me too, that I lost part of my work because of AF Photo handled the situation. I expect much more from such a great software!